Review Fix chats with “Dark Matter” creator Joseph Mallozzi who discusses his new SyFy series, from its origins as a script to eventual Dark Horse Comic to television show. A former writer on the cult-classic and critically acclaimed series, “Stargate-SG-1” and pair of spin-offs, Mallozzi lets us know what to expect from a series that in pre-production, already features a plethora of solid young actors who have appeared on everything from “The Strain, to “Twilight” and even Broadway. Review Fix: How did the series transition from comic books to TV? What was the process like? Joseph Mallozzi: Actually, the script came first. I’d been developing the series for many years while working on Stargate and eventually wrote the pilot. Rather than simply go out and pitch the series, I decided on a different tact. I knew, from my many years working development early in my career, that “established properties” always seemed to garner more attention than original material. And so, Paul and I approached Dark Horse Comics about transforming the pilot (and what would be the show’s second episode) into a four-issue mini. They loved the idea. 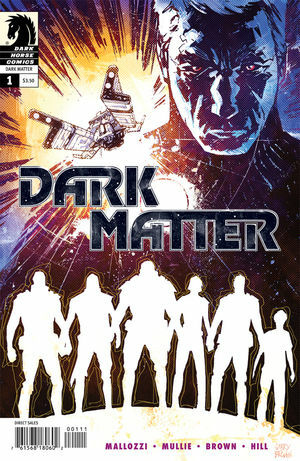 And, sure enough, when it came time to pitching “Dark Matter: The Series,” the comic book proved an invaluable visual tool that really helped make the sale. Review Fix: What is your favorite element of the series? Mallozzi: If there’s one thing I learned early in my television career, it’s that viewers may tune in for the hook, but they stay for the characters. And Dark Matter is, first and foremost, all about its characters. Review Fix: The comic has some awesome characters- you need a special cast to pull it off. What was casting like? Mallozzi: Casting was exciting, fun, frustrating and, ultimately, very satisfying. In many ways, I wish we had three more characters to cast. Review Fix: Who do you think will enjoy this series the most? Mallozzi: Those who enjoy science fiction, serialized drama, compelling characters, and their action-adventure with a dose of humor. Review Fix: Will fans of your previous work dig this? Why/Why not? Mallozzi: I think that fans of Stargate will enjoy Dark Matter, again, for its emphasis on characters, relationships, and its underlying humor – elements that made Stargate such a huge success. Review Fix: What are your goals for this TV series? Mallozzi: Plain and simple, Paul and I wanted to tell a story. And this first season is what we consider Book One in this much longer narrative. Review Fix: What is it comparable to? Mallozzi: Hmmm. Ultimately, if I had to draw parallels to any other work, it would be an anime series called Cowboy Bebop. Review Fix: How is the TV series different from the comic? Mallozzi: The series will add many new layers to the story, the world, and, of course, the characters and their relationships. Still, the four issue trade paperback does a nice job of encapsulating our first two episodes for those looking for a sneak preview. Mallozzi: Head on over to my blog (www.josephmallozzi.wordpress.com) where I’ll be offering up behind-the-scene insights throughout prep, production, and post-production on Dark Matter’s first season.